London's Royal College of Art is a world-renowned institution best known for their masters and postgrad courses that focus on innovations in industrial and communication design. Modern European design-masters lead the way of thinking at this school, and the school's faculty now comes to include some of our own favorites, including Ron Arad, Dutch designer Tord Boontje, Droog’s Jurgen Bey, El Ultimo Grito's Roberto Feo, futurists Anthony Dunne and Fiona Raby, Architect Nigel Coates and graphic designer Neville Brody - just to name a few! We recently hit the school's graduate show, which featured a bevy of radical, quirky and super-exciting design work from a class of international students. Jump ahead for an exclusive look as Inhabitat writer Ana Lisa Alperovich shares her favorite picks from this year's show! 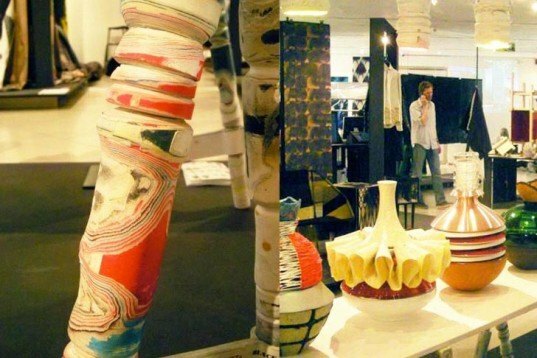 British designer Alkesh Parmar created a series of objects under the Cradle to Cradle philosophy. 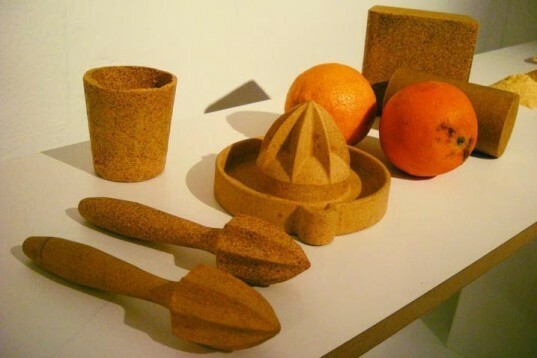 Made from dried and ground orange peels, these objects give new use to a waste material. The process keeps the lamps biodegradable, durable, and as an extra bonus, they smell fruity! Also from Parmar is the “Celebration Chandelier”, a luxurious and sustainable luminaire made from reclaimed champagne corks. 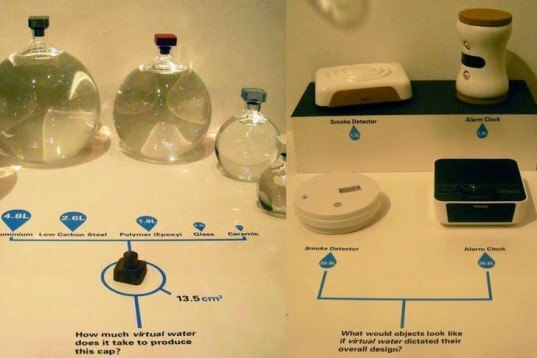 To expose the inherent water usage on products and materials production, American Innovation Design Engineer grad Matt Costello designed “Hidden Smoke Detector & Alarm Clock”, two products that follow his intensive research and are made from renewable materials that take little water: ceramic and cork. The Energy Pilots, by Elliott P. Montgomery are a series of artefacts that revamp energy business models to make them more competitive. This Solar Lottery Ball Tumbler, seen here, makes millionaires by using the sun’s energy! 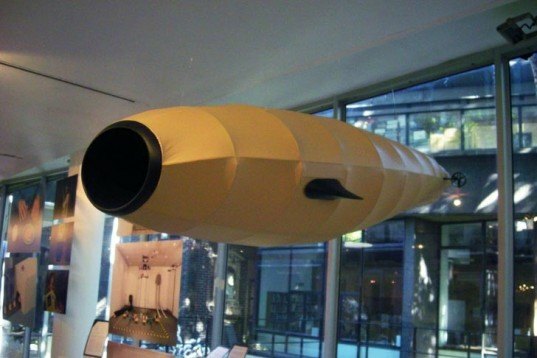 German designer Gerrit Kaiser created “Particle Economy”, a project that focuses on a resource-starved future where “natural” floating particles, from volcanic eruptions or industrial pollution, could be turned into economical opportunities by harvesting them with a flying cloud collector. 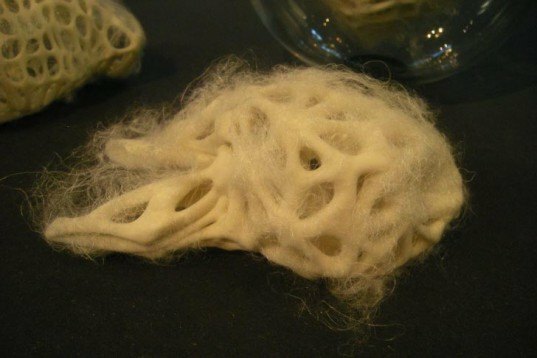 Biophilia by Veronica Ranner are genetically modified silk worms that create biodegradable, soft and very odd cocoons for keeping donors’ organs instead of using machines! 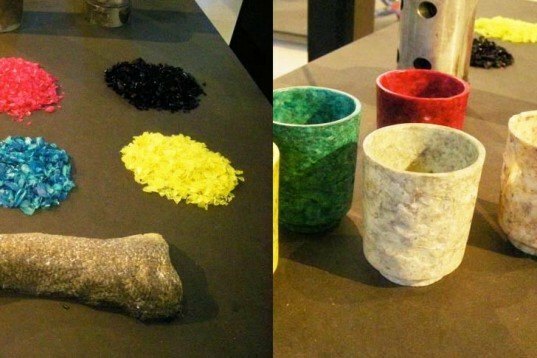 Another project that focuses on drying, grinding and binding waste food is by Erik de Laurens, who created a plastic-like material made entirely from fish scales! This new graduate is looking for funding to extend his idea, which has been designed to be sustainable, local and for small-scale production. 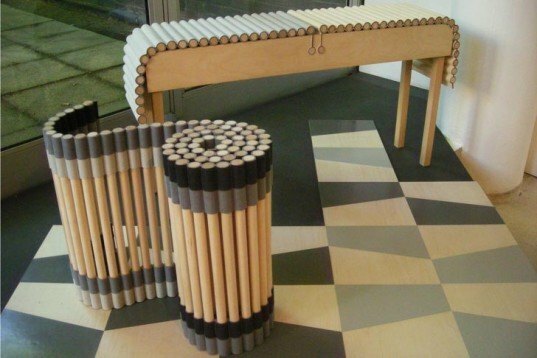 RCA’s Design Products graduate and woodworker James Tooze created an Open Source project for making DIY chairs from scrap wood, and shoes from biodegradable canvas, felt and rubber. Platform 14 ’s Du-chen designed a series of seats called “Active Stools”, which are made from different materials including renewable cork, wood and rubber for an extra bounce. One of the most interesting projects spotted at the RCA’s Show was Pia Wustenberg’s fresh approach to traditional materials, which included a table with paper-lathed legs, lamps and a series of vases made from all sorts of materials including glass, paper, concrete and moss. Space-saving multifunctional furniture is always handy to have around, and these seats based on actions of organisation —stacking, rolling, laying and bundling. By Catherine Aitken, the pieces are made from biodegradable wool felt, eco-friendly Waterborn fabric by Kvadrat and wooden dowes shows a green adapting approach at its best. Without the need to produce new material, designer Mijin Park created a series of durable, weatherproof objects by weaving polypropylene straps traditionally used for packaging. Markus Kayser travelled to the Sahara desert to test his SolarSinter Machine and to explore the potential of desert manufacturing. 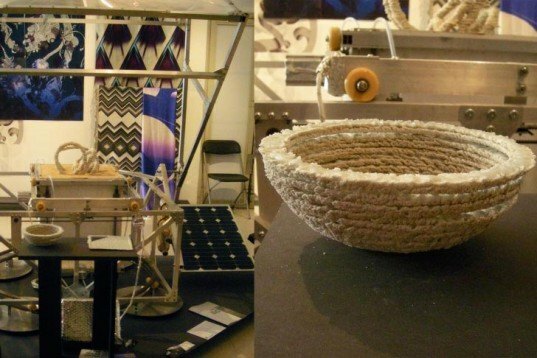 By using a 3D printing process he produces glass objects from sand and solar-power. Communication Arts & Design graduate Jo Blaker has been collecting paper bags since she was a kid. Here she turns them into biodegradable, PVA coated paper vases that she hopes will cast light on the throw-away nature of our culture. We don’t really like to think about death in our daily lives, but if we are going to die, let’s turn it into a sustainable act to try to leave the world in the same, or in a better condition than when we left it. 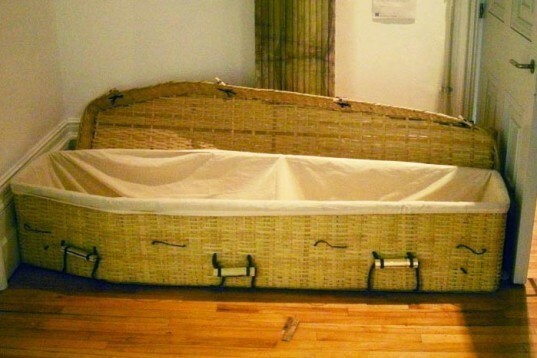 Created for biodegradable and fair trade Ecoffins, designer Nilofar Emami designed a ‘Karma-free’ green coffin made entirely from bamboo ensuring people can go peacefully ‘from nature to nature’. 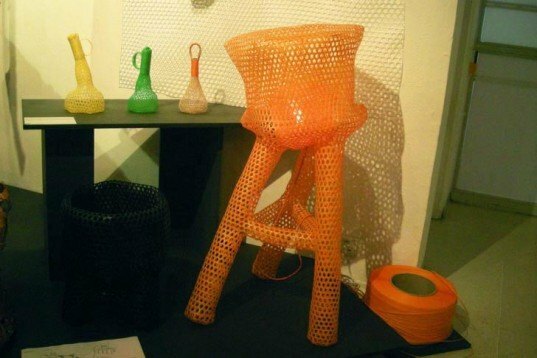 Alkesh Parmar created objects under the Cradle to Cradle philosophy, which are made from dried and ground orange peels. 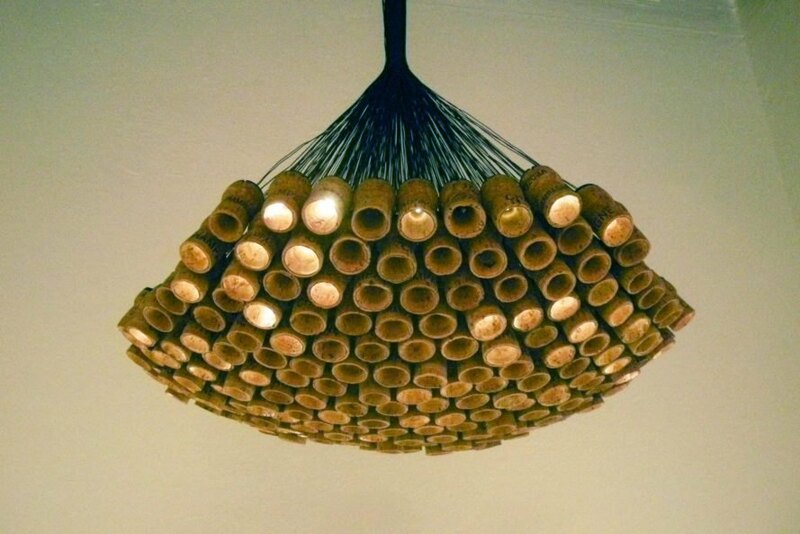 He also made a Celebration Chandelier, a sustainable lighting fixture made from left over champagne corks. To expose the water-intensive process related to product and materials production, Matt Costello designed the "Hidden Smoke Detector" and "Alarm Clock", two products made from renewable materials which require little H2O to make: ceramic and cork. Elliott P. Montgomery's "The Energy Pilots" are a series of artefacts that revamp the conventional energy business model to make it more competitive. 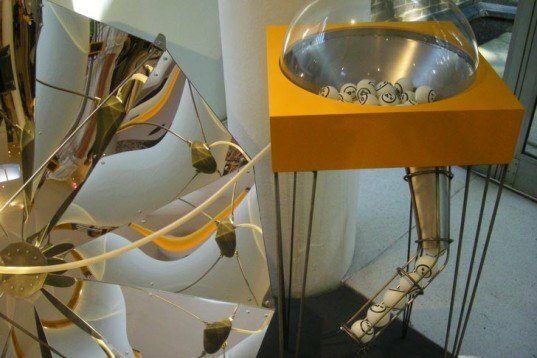 This Solar Lottery Ball Tumbler uses the sun’s energy to produce millionaires! German designer Gerrit Kaiser created Particle Economy, a project that focuses on a resource-starved future where “natural” floating particles can be turned into economical opportunities by harvesting them with a flying cloud collector. Biophilia by Veronica Ranner are genetically modified silk worms that create biodegradable and soft cocoons for keeping donors’ organs, instead of using machines. Another project that focuses on drying, grinding and binding waste food is by Erik de Laurens, who created a plastic-like material made entirely from fish scales! 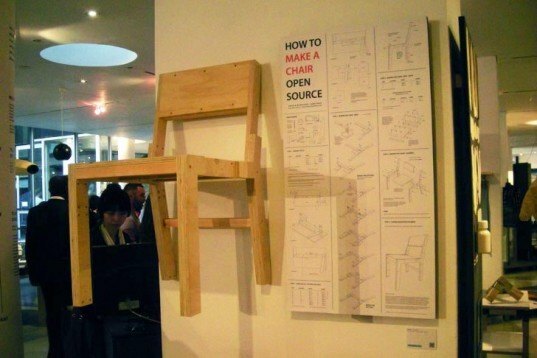 RCA’s Design Products graduate and woodworker James Tooze created an Open Source project for making DIY chairs from scrap wood. 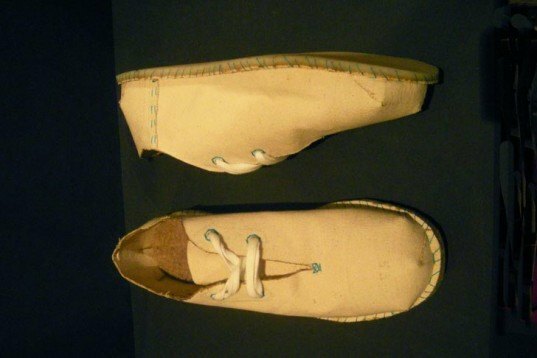 Also available, DIY biodegradable canvas, felt and rubber shoes. Chinese-born Du-chen designed a series of seats called Active Stools made from renewable cork, wood and rubber for an extra bounce. Pia Wustenberg’s fresh approach to traditional materials and craftsmanship processes included a table with paper-lathed legs and a series of vases made from all sorts of materials including glass, paper, concrete and moss. Catherine Aitken's multifunctional furniture is made from biodegradable wool-felt, eco-friendly Waterborn fabric by Kvadrat and wooden dowels. Without the need for producing a new material, designer Mijin Park created a series of durable weatherproof objects by weaving polypropylene straps traditionally used for packaging. Markus Kayser travelled to the Sahara desert to test his SolarSinter Machine and explore the potential of desert manufacturing, making 3D printed objects from sand and solar-power. 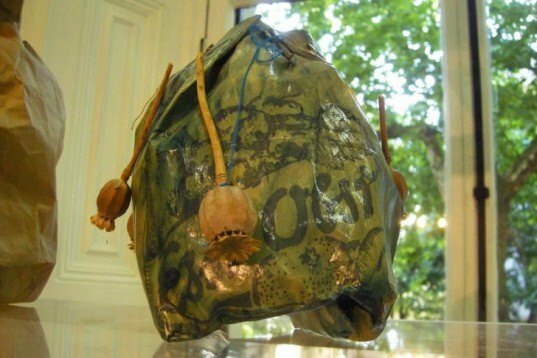 Jo Blaker turned her own paper bag collection into biodegradable, PVA coated paper vases to bring attention to the throw-away nature of our culture. Nilofar Emami created a ‘Karma-free’ green coffin made entirely from bamboo, ensuring people can peacefully go ‘from nature to nature’.